At the page Making Sense of the Traditional Mongolian Script, I introduced the Mongolian script as taught in Inner Mongolia, reflecting what I've learnt in classes and the book Monggol chagaan tolgai kart (Монгол цагаан толгой карт). There are, however, other slightly different approaches to teaching the Mongolian script. Two of these are outlined below, both found in material from Mongolia. 1. The non-syllabic letters (that is to say, plain consonants without a vowel) are not handled in a separate list; they take their place in the syllabic tables at the head of each column. (In the tables, I've highlighted these plain consonants with grey shading). 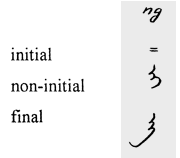 Like syllabic forms, the non-syllabic consonants come in initial, medial, and final forms. However, because some consonants have no word-final forms (i.e., they are always followed by a vowel at the end of a word), the word-final slot is empty for those letters. This unified approach keeps all forms of a consonant in one table, in contrast to the Inner Mongolian approach which splits them between two tables (i.e., open syllables and syllable-closing forms). 2. The vowels are presented in a separate chart before the list of syllables. This keeps the vowels as letters conceptually separate from vowels as syllables. The Inner Mongolian approach includes the vowels in the list of syllables, but does not truly treat them as syllables. 3. The х (x) and г (g / ɣ) columns are each split in two in order to keep the two letter forms / (preceding masculine/yang vowels) and (preceding feminine/yin and neutral vowels) apart. The Inner Mongolian maintains a unified approach whereby the х (x) and г (g / ɣ) columns are distinguished solely by pronunciation, resulting in the mixing of the two letter forms within the columns. 4. The inventory of standard letters is slightly different. The book includes the v/w column as a standard letter, whereas in the Inner Mongolian approach it is assigned to 'other letters' (a category comprising mostly letters used in transliterating foreign words). In addition, the syllable-ending and ŋ forms, and the letter lx, mainly found in words of Tibetan origin, are included as 'extra letters' in this book. 5. The order of letters is different. The order is: n, b, x, g, dʒ, j, t, d, m, tʃ, r, s, ʃ, l, p, v, ŋ, lx. 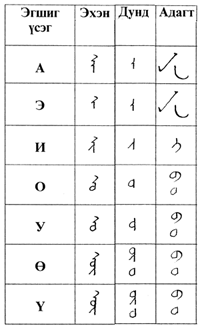 (In Cyrillic: н, б, х, г, ж/з, й, т, д, м, ч/ц, р, с, ш, л, п, в, нг, лх), summed up in a table of the tsagaan tolgoi (given in printed forms only). Many of the discrepancies between the two approaches (such as differences in ordering and differences in the inventory of 'standard characters') appear to represent divergences in standardisation. However, the different approach to the listing of syllable-ending letters reflects the differing purpose and audience of the two books. The Inner Mongolian book is targeted at children, to whom it is taught as the primary script. The strong emphasis on understanding syllabic structure (including the way that syllables are closed) is pedagogically designed to aid acquisition. Where pronunciation needs to be elucidated, the Inner Mongolian approaches uses IPA or other romanised transcriptions in preference to Cyrillic. To distinguish among vowels, a system of numbering is employed. On the other hand, Minii Mongol Bichig is aimed at adults who can already read and write Cyrillic and the Cyrillic script is used throughout the book as an aid to understanding the traditional script. Traditional spellings are directly transliterated into Cyrillic letters. For example, the traditional spelling of the word for 'father' is rendered in Cyrillic transliteration as 'абу' (IPA abʊ) and the traditional spelling for 'mother' is rendered in Cyrillic transliteration as 'эжи' (IPA ədʒi), whereas the modern Mongolian written form of these two words is 'аав' (shown as a:b in IPA) and 'ээж' (shown as ə:dʒ in IPA) respectively. Also, since Cyrillic can distinguish all seven vowel sounds, there is no need to resort to numbering. Given this reliance on the Cyrillic alphabet as a standard for approaching the traditional script, it is not surprising that non-syllabic letters are included along with syllabic forms in the tables as a matter of convenience. The charts below are reworked from the book. Each table is headed by the Cyrillic letter used in the book itself, followed in parentheses by the IPA symbol as used elsewhere in this section of the site. The order of syllables is: no vowel; a, e, i, ɔ, ʊ, o, u. The word эхэнд exend means 'initial', дунд dʊnd means 'medial', and адагт adagt means 'final'. 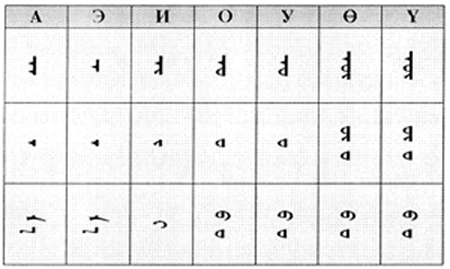 The vowel chart gives the vowel letters (not vowel syllables) used in the traditional alphabet. 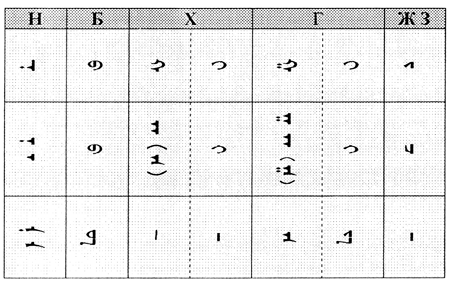 Below, the х (x) and г (g / ɣ) columns are split up in order to keep syllables using / and apart. Note that х (x) does not occur as a final consonant. In the book, syllable and word-final forms for d are the subject of a special note rather than a table. Note that т (t) does not occur as a final consonant in this chart. Additionally, д (d) has as word-final form and as medial form after vowels. In final position, the letter ч (ц) (tʃ - ts) never occurs by itself without a following vowel. The letter ш (ʃ) is never found alone in final position. Other: нг / ŋ (medial and final )and лх / lx (initial and final ). 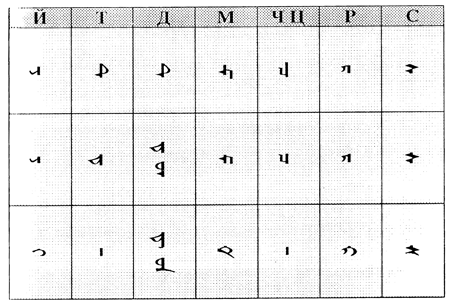 (To match the typeface in the following tables to handwritten forms, see Handwritten and Typeface Forms of the Traditional Mongolian Script). The second presentation is that contained in Manuel d'écriture mongole by Šaravyn Čoymaa and Alain Desjacques, published in Ulaanbaatar in 2003 (ISBN: 9992976098) (image here). The work is in French and is thus directed at foreign learners. It assumes no knowledge of the modern language. Instead, only the ancient pronunciation of the alphabet is given, with no reference at all to the modern spoken pronunciation. The order of the letters differs from both the Inner Mongolian standard ordering and that found in Minii Mongol Bichig. The ordering is (in IPA): plain vowels, l, m, n, x/g/ɣ, ŋ, t/d, r, j, dʒ, s, tʃ, ʃ, and v. This appears to be mainly for pedagogical purposes and makes no claim about the correct ordering of the Mongolian alphabet. The book uses a traditional transcription of Mongolian. Vowels are a, e, i, o, u, ö, and ü, which are equivalent to a, ə, i, ɔ, ʊ, o, and u (quasi-IPA) used here and Cyrillic а, э, и, о, у, ө, ү. Differences in the consonants include: q instead of modern x, k instead of modern x and g, j instead of dʒ, c instead of tʃ, y instead of j, š instead of ʃ, and ng instead of ŋ. The most confusing column by far is the x/g/ɣ (x/г) column. 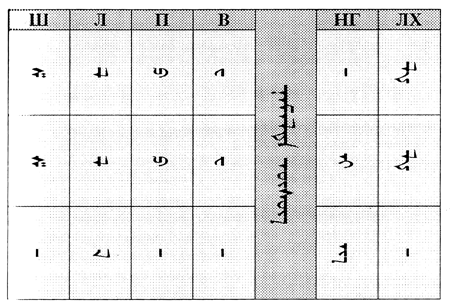 Unlike the Inner Mongolian treatment, which gives the x column and the g column as two unified columns, or the treatment in Minii Mongol Bichig which creates four columns split according to the letter used ( / and ), the treatment here treats them in terms of four ancient consonants, q, k, ɣ, g, which do not fall into an immediately apparent system and are difficult to relate to the modern pronunciation.